Oil Paintings. For many years, I have done oil paintings (on canvas and on panel) but in 2015, I needed to produce a large number of them for the house (and some to go in people's private collections and so on). So, having worked professionally as Derby's Pavement Artist and even beat the panel in the Thames Television Programme 'What's My Line' back in the 1980's (I still have the certificate), I have produced paintings in a number of styles. This puts an interesting slant on what can go on the walls because anything can go there: from non-representational art similar to that of Mondrian and Kandinsky; right through the spectrum to the work of the Flemish artists Jan Van Eyck, Rogier Van Der Weyden and so on who worked at the beginning of the Northern Renaissance, around 600 years ago. So, have a look and if you really want, you can buy a print, a mobile phone case (Samsung, iPhone), a tee-shirt/sweatshirt or even a mug with the image on it - have a look at the online shop. PC Plus HelpDesk. First of all, those of you who read PC Plus magazine will know that I used to write for the HelpDesk section in the magazine - this I used to do along with with Wilf Hey until his death in January 2007 (I've actually worked with Wilf, writing in computer security for over a decade and assisted him with some projects for his Wilf's Programmer's Workshop in PC Plus as well). In the HelpDesk section, I cover Windows, Linux, BSDs, UNIX, Internet and hardware. After six months, the publisher's exclusive right to print the material that I wrote for the PC Plus SuperDVD expires so that I can do with it what I want (although Future can still publish it as well). All I do is put the material on this site so that you can look at it, decide that the magazine suits your needs perfectly and go and order a subscription or, just have a browse. The articles published on paper in the magazine are provided on each month's CoverDisc in pdf format as an archive so you can get old articles from that source. The SuperDisc contributions are not repeated though, so, you can find the archive of up to six months ago (that is to say, from issue 204 up to the issue that was published six months ago) on this site. Of course, looking at this site, you might see an article that you want to have a hard copy of and if this is the case, you can order back-issues from Future Publishing's customer services. If you click on the link on the left, you can access the HelpDesk sections that I have written for the SuperDVD. Daily Sudoku Puzzles. I've added a daily sudoku puzzle to this site so that you can do a fresh one every day. Every single one of these has been compiled especially for this web site so you know that you have never seen them anywhere else before. You can see archives for the puzzles and a list is at the bottom of the page. Some will seem more difficult than others and I'm sure that if you visit the site seven days each week, you will have a lot of fun. One thing that can make Sudoku easier is familiarity with the symbols used to populate the cells. So, to make things insteresting, I also put on the website, a version of the puzzle that uses Gurmukhi numbers like that on the left. This makes it very intersting. You can find the Gurmukhi Sudoku puzzles by clicking first on either 'Daily Sudoku' or, on Gurmukhi Fridge Magnets - this takes you to the same page (you can also see the last four puzzles on one page as well). Daily Kakuro Puzzles. In the Puzzler Kakuro book (Issue 2 UPC 9771749405005 02), there is a statement on page 3 that '... our Japanese colleagues assure me that it isn't possible to make Kakuro by computer.' To me, this sounded like a challenge. So, I set about writing a program in Perl that produces Kakuro puzzles automatically every day. The week's puzzles start off with an easy one on Monday and gradually build up until the one on Sunday is substantialy more difficult. Each one has an estimate of the amount of time it should take to do, based on the amount of time I took to do a number of puzzles - the results being put against a number of factors in the program and put through a linear regresssion. I have also put together a Kakuro tutorial so that people with no experience of Kakuro or Sudoku can work through an example puzzle, picking up many of the necessary skills. Like the Sudokus, every single one of these has been compiled especially for this web site by my computer program so you know that you have never seen them anywhere else before. You can see archives for the puzzles and a list is at the bottom of the page. Some will seem more difficult than others and I'm sure that if you visit the site seven days each week, you will have a lot of fun. In the summer of 2007, Implicit Software Solutions contacted me about producing Kakuro problems for Windows Mobile. The result is iSS Kakuro with over a million puzzles to do, different sizes and graded in terms of difficulty. The problem is NP complete so it produce an interesting problem regarding the user having a new puzzle within a certain time but this was solved (no, before you start worrying about public key cryptography, we didn't come up with a solution for NP complete problems). The difficulty is graded in terms of the strategies you need to solve any particular puzzle, not its size (at all). So, if you have a machine that runs 'Windows Mobile', can't keep away from my Kakuro puzzles but don't have an internet connection everywhere you go, you can get them from iSS. Recipes. I've put some of my recipes on this site so that once you are here, you don't have to go to my other sites to see them. This is all good quality, reliable food that caters for the lazy chef as well as those willing to put a little more effort into cooking. Learning Gurmukhi. This web site will leach you how to read and write Gurmukhi. There are plenty of resources on the site including animated graphics showing you how to draw the characters, PDF files for various purposes and some really good ray-traced wallpapers. If you are learining Punjabi or just want to learn how to read and write Gurmukhi for some reason, this is the site to go to. 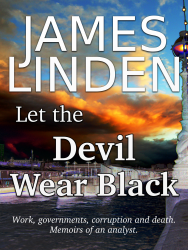 can buy a copy of James F Linden's book, 'Let the Devil Wear Black' 377pages, 140,000 words ISBN:9781983317057 directly from Amazon. All over the world, British justice is seen as the best. That is, until you start scratching away at the surface. Set in the Manchester of John Major and Tony Blair's 1990s, this is a true story of what happens when a company decides to act in an unorthodox manner towards one of its employees when he finds out too much about them. Deliberate releases of toxic gases? Connections with South Africa's government during the twilight years of the apartheid regime? Safety devices or something else? Something worse? Something that involves everybody? Following a tip-off from someone inside the personnel department, Alan Rush decides to take the unique step of bugging his own disciplinary hearing - something that the company is totally unprepared for. Subsequently, surrounding a disastrous Industrial Tribunal hearing where the company loses control of virtually every aspect of the case, there are suspicious deaths, telephone tapping, fraud and so on. This book is a must for anybody doing a law degree or for anybody who is thinking of taking a company to an industrial tribual themselves. The original evidence that was used to write the book has been used by the author in lectures in University degree courses for Law and for Forensic Science. It shows you the sort of thing that you can expect to see (looking at the other cases that were being tried at the same time, at least some of what happens in the case in the book is seen in most cases - a company goes there to win, not to accept defeat) and hopefully, this book will give you enough of an insight to stop this from happening to you. Revenge is, of course, a dish that is best eaten cold and this book has enough to fatten anybody. Project Pitcher Plant. Download software to make spammers life a misery. With this and a home broadband connection, you can poison spammer's address lists, lock up their botnets and make them waste their time trying to hack into non-existent mailboxes. See how it is done on this site. Water Rocket Index. This site of mine had been around for many years and many sites linked to it in its old location on the CompuServe server - unfortunately that server is no longer up - and now, it is on this server. Discover how to make your own water rocket and launcher. Also, download my computer model for free. There are plenty of other resources on there are well such as how to make a parafoil parachute. In 2007, I was contacted by the company that produced the special effects for the Sky One program Crash Test Dummies and I ended up doing the computer modelling for the sequence in the last program where they are launched over a fence using two fire-extinguisher water rockets (which, as you can see from the program, was a success). Contact. Write to me if you have any comments. at 20:17:19 GMT on 19th April 2019. This server has served 6,833,946 pages externally.